Shifting from mermaids to unicorns, this palette is that I wished the Urban Spectrum Palette to be. 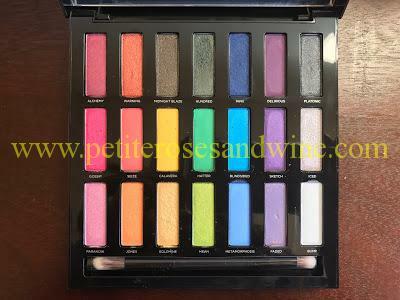 There are three rows each with seven eyeshadows organized in a rainbow fashion. 21 Urban Decay Eyeshadows are showcased against a shiny black case. I can see it used with a trio of like colors vertically or even a full on rainbow eye with an entire row. As someone who usually gravitates towards natural eyeshadows, this will be fun addition to my makeup collection. I love that it has a hinged lid with a huge mirror. One of the reasons why I didn’t purchase the Urban Spectrum Palette was due to the lack of a hinge. This palette is more travel friendly than the Urban Spectrum Palette as well, but I personally wouldn’t travel with this palette.